Commenting on the upcoming study group of John Perkins’ book “Shapeshifting” and other musings. This is a work in progress, but I wanted to at least make a start in writing about the three cornerstones of who I strive to be. Being present: Focusing on the right kind of thinking, for example, not regretting the past or living in fear of the future. Being present means not letting the experience of the moment slip by because I’m caught in thinking about the past or the future, obsessing over what-if scenarios, etc. It means getting into deep connection with what is actually observable, both externally in the world and internally in my psyche. From being present, I can stay balanced (equanimity), have accurate observations, and make clear discernment regarding my feelings. At the same time, I strive to develop the skills to enter into a place of non-resistance, non-judgement, and non-attachment. I am not resisting the future, I am not judging the present, I am not attached to the past. This comes from Marshall Rosenberg’s Non-Violent Communication. If coming from the higher ego (compassion, love, forgiveness, empathy, etc), expressing or acting on those needs. That’s about as clear as I can say it at the moment–it doesn’t feel completely clear, but at least it’s a start! When we change our relationship with the past, it changes our experience of the present and what we can accomplish in the future. I suppose this is at the core of psychoanalysis, the Sunday sermon, the self-improvement books, the meditations, the vision quests, or whatever it is that floats your boat. But really think about it for a minute – actually, really feel it. We’ve all had experiences where we’ve changed our relationship with something in the past – we come to an understanding of someone’s actions (or a deeper understanding of our own), we forgive a person (or ourselves), we gain some knowledge, some perspective, that brings us into a different relationship with our past. And some of those “shifts” result in us seeing ourselves and the world in a new, sometimes subtly different, sometimes dramatically different way. 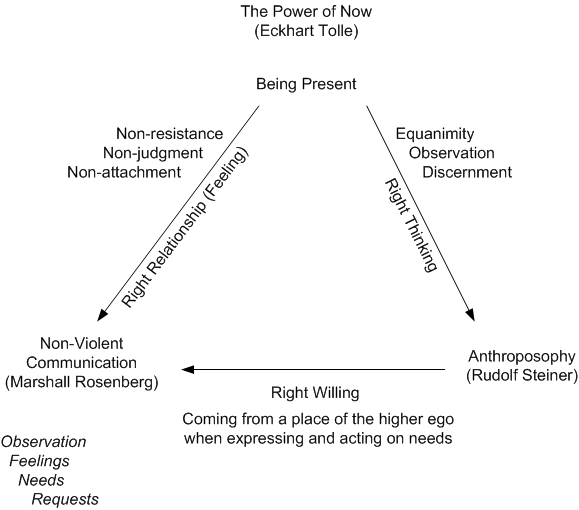 We experience the present with a new quality, a new awareness, a new wakefulness. And our experience of the present has a direct impact on us, it shapes what we do each moment, and in that shaping, it shapes our future. and in that intention, in changing my relationship, I do change.